• No contact with actors and props. • No smoking on or around the premises. • No refunds under any circumstance. • Video surveillance is in use and we have cameras throughout the experience. • No food, beverages or weapons allowed inside. • Stay with your group at all times and no running. • Expectant mothers, and people with heart, back or breathing problems should enter with caution. People with epilepsy should not enter. We use strobe lights, black lights, fog machines, etc. When Does Love Bites Run? 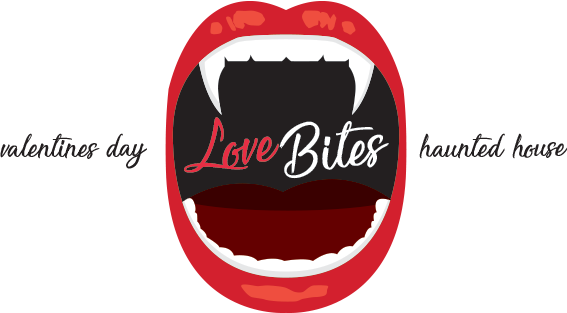 Love Bites is a Haunted House, featuring creepy scares, jump scares, and at times gorey situations. Please use discretion when bringing children. At this time you can not pre book a time to visit Love Bites, however we try to keep lines as short as possible. We accept most forms of payment, including but not limited to MasterCard, Visa, Cash, Debit and delivery via Carrier Pigeon. Love Bites Walk through is a 15 to 20 minute experience. Love Bites is a PG experience, we recommend parents use discretion when visiting. Is it ok for people with mobility issues? The experience involves 4 sets of stairs.